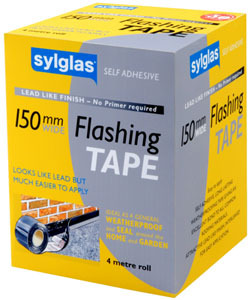 Extending their line-up of products even further with the introduction of a new flashing tape, Sylglas - one of the premier leaders in the home and garden DIY market - gives retailers a welcome opportunity to increase their profit margins. This self-adhesive, long-lasting Looks Like Lead Flashing tape, with its attractive lead-style finish, gives a reliable bond to all common roofing materials. Interleaved for easy application, it has a lacquered aluminium foil finish suitable for heavy-duty applications. Its many uses include repairing existing flashings on a property, sealing and repairing porches, valley gutters, extension flashing and chimneys. Can also be easily cut and shaped without the difficulties when working with lead, to form a decorative finish, if required. With no primer and little surface preparation to be used, if any, the tape is easy to use and apply as it simply requires peeling and sticking and can be applied at any time of the year. It meets a wide range of needs and is available in 150mm width by 4 metre rolls. "Potential need for this product is considerable," says Martin Lowe, Marketing Manager Distribution Products for Sylglas, "homeowners want to protect their properties at all costs hence there is clearly a substantial market for retailers who can stock a fast moving product designed for emergency repairs around the home." Through its extensive network of independent retailers and major national chains, Sylglas - which is celebrating its 50th anniversary this year - can offer a complete range of products and solutions tailored to consumer needs. Responding to a TEN YEAR old post is not the way to ask! Do you supply lead look alike strip in 9mm width? I am looking for an alternative to lead to give look like leaded glass, but applied to a sheet of double glazed glass.